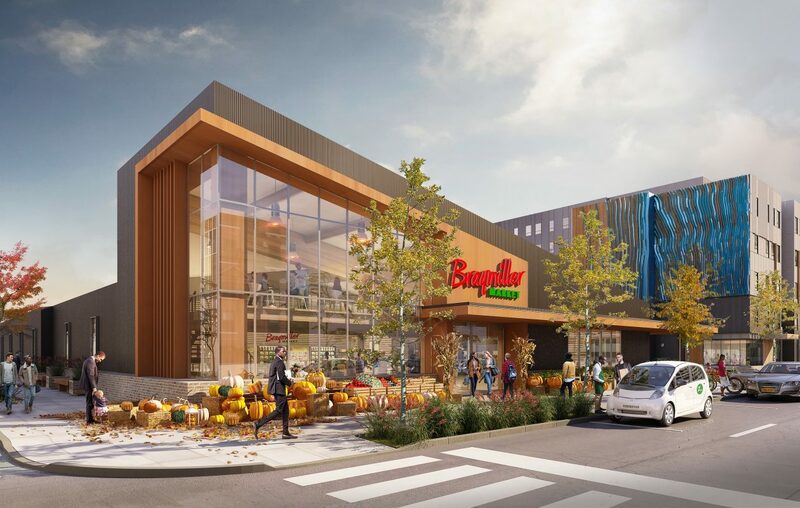 After more than two years of planning, Ciminelli Real Estate Corp. is taking the first steps toward obtaining city approval for its proposed affordable apartment building and fresh-foods market in downtown Buffalo. The Buffalo-based developer is planning to construct a 220,000-square-foot complex of two buildings on a 2.5-acre city-owned parking lot, located at 201 Ellicott St.
Plans by Cannon Design call for 201 units of affordable housing in a residential building that will rise seven stories along Oak Street and five stories along Ellicott, plus a single-story market of about 20,000 square feet, according to an application to the Zoning Board of Appeals. The project would be built by Arc Building Partners. The H-shaped apartment building will include 131 one-bedroom apartments of 623 square feet each and 70 two-bedroom units of 850 square feet, plus one two-bedroom superintendent's unit. About 73 percent of the apartments, or 147 units, will be affordable for households earning 50 percent or 60 percent of the area median income, while the remainder are set at 80 percent of AMI. The store, which will be owned and operated by the owner of Braymiller Market in Hamburg, will include a large wholesale business to service local restaurants and a smaller retail section to sell fruits, vegetables, prepared foods and other items. The wholesale division will be the primary source of revenues for the market and will subsidize the retail store, the application said. Ciminelli is asking the Zoning Board to grant 14 variances from the Green Code for the two buildings, including for the low height of the grocery store building, since the minimum requirement for that part of the city is three stories instead of one. Other variances deal with setback, window transparency, fence height, the location of a loading area and the location of parking. The board will consider the application April 17.